1.1 How Jet Streams Affect Weather? 2.4 Why no south-west monsoons during winter? 2.6 Why no south-west monsoons in March – May (summer)? Indian Monsoon Mechanism – Jet Stream Theory. Role of Sub-Tropical Jet Stream (STJ). Why no south-west monsoons during winter? Why no south-west monsoons in March – May (summer)? Indian Monsoon Mechanism – Modern Theory: Jet Stream Theory. Jet stream Theory is the latest theory regarding the origin of the monsoons and has earned worldwide acceptance from the meteorologists. To understand how Jet streams affect Indian monsoons, we need to know the basic mechanism of Jet Stream induced weather conditions. How Jet Streams Affect Weather? This condition occurs due to weakening of jet stream due to lesser temperature contrast between sub-tropics and temperate region (Our concern is STJ only). 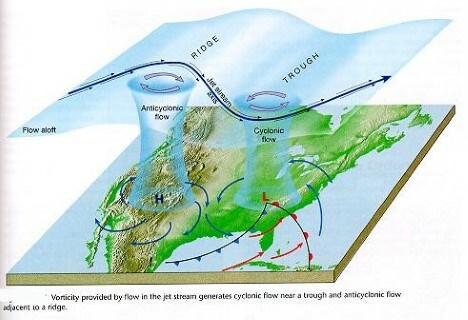 Usually the trough region [the region exactly below the jet stream trough] creates cyclonic condition (low pressure) at the surface of earth whereas the ridge regions creates anticyclonic condition. 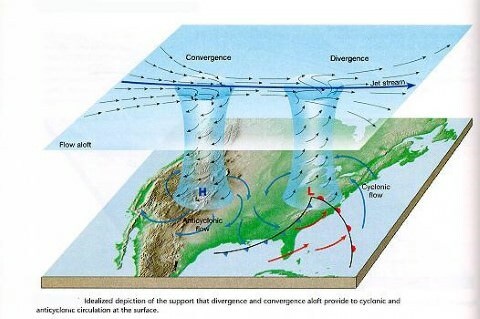 Troughs create upper level divergence which is associated with convergence at the surface (low pressure – cyclonic conditions) and ridges create upper level convergence which is associated with divergence at the surface (high pressure – cyclonic conditions). These ridges and troughs give rise to jet streaks which are also responsible for cyclonic and anticyclonic weather conditions at the surface. The winds leaving the jet streak are rapidly diverging, creating a lower pressure at the upper level (Tropopause) in the atmosphere. The air below rapidly replaces the upper outflowing winds. This in turn creates the low pressure at the surface. This surface low pressure creates conditions where the surrounding surface winds rush inwards. The Coriolis effect creates the cyclonic rotation (cyclonic vortex) that is associated with depressions [low pressure cells]. The winds entering the jet streak are rapidly converging because of the high pressure at the upper level (Tropopause) in the atmosphere. This convergence at upper troposphere leads to divergence (high pressure) at the surface (anticyclonic condition). But how does this mechanism of jet streams influence Indian Monsoons? Sub-Tropical Jet stream is a narrow band of fast moving air flowing from west to east [Westerlies]. STJ in northern hemisphere flows between 25° to 35° N in the upper troposphere at a height of about 12-14 km (all this already discussed in previous posts on Jet Streams). (Here we will consider STJ only. Polar Jet has no influence on Indian monsoons). The wind speeds in a westerly jet stream are commonly 150 to 300 km p.h. with extreme values reaching 400 km p.h. In winter STJ flows along the southern slopes of the Himalayas but in summer it shifts northwards, rather dramatically, and flows along the northern edge of Himalayas in early June and in late summer (July-August) along the northern edge of the Tibetan Plateau. The periodic movement of the Jet stream is often the indicator of the onset (STJ shits to the north of Himalayas in a matter of days) and subsequent withdrawal (STJ returns back to its position – south of Himalayas) of the monsoon. Westerly jet stream blows at a very high speed during winter over the sub-tropical zone. This jet stream is bifurcated by the Himalayan ranges and Tibetan Plateau. The two branches reunite off the east coast of China. The northern branch of this jet stream blows along the northern edge of the Tibetan Plateau. The southern branch blows to the south of the Himalayan ranges along 25° north latitude. A strong latitudinal thermal gradient (differences in temperature), along with other factors, is responsible for the development of southerly jet. Meteorologists believe that southern branch of jet stream exercises a significant influence on the winter weather conditions in India. The upper jet is responsible for steering of the western depressions [Western Disturbances] from the Mediterranean Sea. Some of the depressions continue eastwards, redeveloping in the zone of jet stream confluence about 30° N, 105° E (near east coast of China). Winter rain and heat storms in north-western plains and occasional heavy snowfall in hilly regions are caused by these disturbances. These are generally followed by cold waves in the whole of northern plains. The southern branch is stronger, with an average speed of about 240 km compared with 70 to 90 km p.h. of the northern branch. Air subsiding beneath this upper westerly current gives dry out blowing northerly winds from the subtropical anticyclone over northwestern India and Pakistan. Why no south-west monsoons during winter? With the beginning of summer in the month of March, the STJ [upper westerlies] start their northward march. The southerly branch of STJ remains positioned south of Tibet, although weakening in intensity. The weather over northern India becomes hot, dry and squally due to larger incoming solar radiation and hot winds like loo. Over India, the Equatorial Trough (ITCZ) pushes northwards with the weakening of the STJ [upper westerlies] south of Tibet, but the burst of the monsoon does not take place until the upper-air circulation has switched to its summer pattern. By the end of May the southern jet breaks and later it is diverted to the north of Tibet Plateau and there is sudden burst of monsoons (the ridge moves northwards into Central Asia = high pressure over north-west India moves northwards into Central Asia = makes way for south-west monsoon winds). An Easterly jet emerges over peninsular India with the northward migration of STJ. The upper air circulations are reversed with the emergence of Easterly jet [convergence in upper layers is replaced by divergence == divergence in lower layers is replaced with convergence == high pressure at lower layers is replaced by low pressure system]. 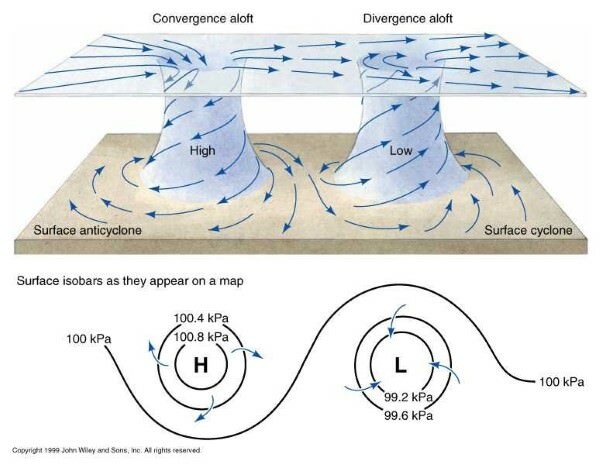 The easterly winds become very active in the upper troposphere and they are associated with westerly winds in the lower troposphere (south-west monsoon winds). Western and eastern jets flow to the north and south of the Himalayas respectively. The eastern jet becomes powerful and is stationed at 15° N latitude. This results in more active south-west monsoon and heavy rainfall is caused. Why no south-west monsoons in March – May (summer)? There is good sun’s insolation from March – May but still there is no s-w monsoons. Reason: The ridge region of Southern branch of STJ creates strong divergence (high pressure) in north-west India. The diverging air blocks incoming winds and prevents strong convergence of winds along ITCZ. During the summer season in the Northern Hemisphere, low pressure areas develop at the ground surface near Peshawar (Pakistan) and north-west India due to intense heating of ground surface during April, May, and June. As long as the position of the upper air jet stream is maintained above the surface low pressure (to the south of Himalayas), the dynamic anti-cyclonic conditions persist over north-west India. The winds descending from the upper air high pressure [because of the ridge of STJ] obstructs the ascent of winds from the surface low pressure areas, with the result that the weather remains warm and dry. This is why the months of April and May are generally dry and rainless in spite of high temperatures (low pressure on land) and high evaporation.